The menu at this Brooklyn pizza shop is packed with odd items, offering everything from kale to avocados to ground beef on their pies. But if you want to try something truly out of the ordinary, you’ll need to check out the special boards. Normally these pies play punny homage to pop culture icons, complete with illustrations. One particularly odd choice? The Severus Grape, in honor of the late Alan Rickman, served with grapes, bacon, gorgonzola, roasted red peppers, and a drizzle of honey. There are a few major distinctions between traditional Italian pizzas and Swedish pizza: The latter’s crust is thinner, different herbs are added to the tomato sauce, and it’s topped with some pretty unorthodox options -- like bananas and red curry. Red’s is owned by two Swedish brothers who wanted to introduce Americans to Swedish style pies, so they brought the tradition of topping savory pies with bananas onto the menu. Many compare the pie to Hawaiian slices, but we have a hunch this option might be a bit more incendiary. Durian, if you haven’t had the pleasure, is a fruit described by many as “smelling like hot garbage.” However, even things that smell like hot garbage have their fans, and those fans congregate at C Fruit Life in Queens. The Hong Kong style dessert cafe serves up treats like mango smoothies and durian mochi -- and also tops a traditional-looking pizza (yep, there’s mozz on it) with the contentious stuff. Just pack the breath mints for after dinner. Ordering anchovies on your pizza is practically blasé these days -- but there are plenty of pizzerias taking seafood on pizza to a very fishy new level. The Tonno pizza at Gianfranco’s started with a practical purpose: it was served during Lent on Fridays, when Roman Catholics are supposed to abstain from meat. But in the decades since, the pizza has become a fan favorite, despite its unusual form. The tuna salad is made in house, then spread onto the baked pizza crust, almost serving as the sauce. Then shredded lettuce, sliced tomato, and a special “secret” dressing and seasonings are spread over top. It’s served cold, so there’s no need to get uneasy about cooked lettuce (read: the nastiest thing on earth) here. Those behind Matthew’s Pizza say they opened the first pizzeria in Baltimore, so it’s only fitting that such a historic place also has a tribute to Maryland’s most famous export: the crab. More specifically, Old Bay and crabs. The crab pie is loaded with crab meat, and Matthew’s rejects the idea that cheese and fish don’t complement each other. This pizza smothers caramelized onions in both grated mozzarella and imported reggianito cheese. Then, it’s all dusted with Old Bay because this is Baltimore. Picture your family crab dip recipe, but on a pizza. Sure, there are plenty of places around the country (well, mostly in New England) where you can get some lobster meat haphazardly tossed onto a slice. 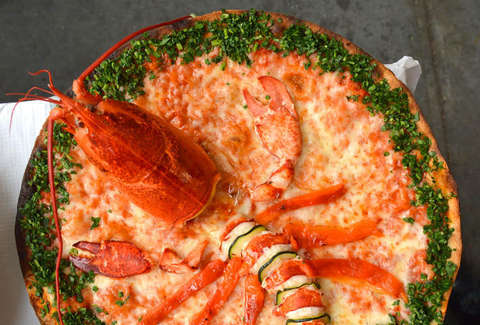 Go to Florian in Manhattan, though, and you will find an entire 1lb lobster (including the head) laid out on top a thin crust, mozzarella cheese, and burrata. The presentation makes this one of the most Instagram-worthy pizzas out there, and at $32, it’s the cheapest way to impress your date with lobster (while still getting a taste yourself). On Christmas Eve, lots of Italians participate in the “Feast of the Seven Fishes” -- a long dinner where (at least) seven different types of fish are consumed over the course of the evening. It takes forever, and everyone is uncomfortably full after. So, SliCE, a Philly pizza joint with several locations throughout the city, started offering a “Pizza of the Seven Fishes” throughout the month of December. It’s topped with sautéed clams, mussels, shrimp, tuna, crab meat, anchovies, and sardines, then some lemon and basil. (And, yes, mozz cheese -- otherwise this would just be fishy bread.) You can only get it from Dec. 1-24. Your favorite foods… on your other favorite food. Ian’s started as a by-the-slice pizzeria that served hungry college kids from the University of Wisconsin the stuff of their 4am munchie dreams (think mac & cheese pizza, or anything the Ninja Turtles would order). 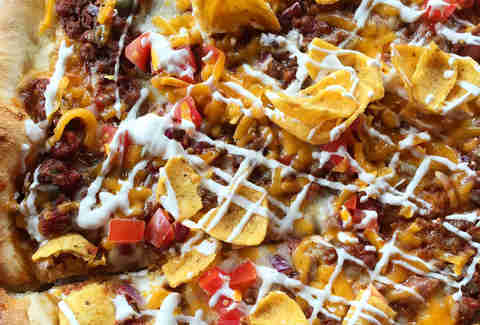 Their monthly specials are where the weirdest options lie -- including this Frito Pie-inspired… well, pie. They make their own beef chili in house, spread that over the pie, top it with onions, cheddar cheese, sour cream, and then crunchy Fritos. Double points to anyone who can eat the whole slice out of a chip bag. Falafel is really the closest thing a vegan is going to get to a meatball, so give thanks to Benny’s Kosher Pizza, which added the deep-fried chickpea balls to traditional slices. At first glance, the slice could even fool a carnivore into thinking it’s a meat lover’s pie. Besides the falafel slice, they also offer french fry pizza -- topped with either traditional or spicy fries. Both options make Benny’s basically a trip to Halal Guys in pizza form. This pie is so popular, it warrants a countdown on the restaurant’s homepage. The pizza makes its debut on a single day before Thanksgiving each year, and is only available for 24 hours. It’s a complete Thanksgiving dinner on a slice: slow roasted turkey, mashed potatoes, gravy, stuffing -- and of course, cranberry sauce on the side. Besides the countdown, Fellini takes orders weeks in advance. Despite the popularity, the pizzeria says they’ll never be able to offer the Thanksgiving Pizza as a regular menu item: just preparing for the single day of orders takes about a week of prep work. It’s for the best, though; if you could get it anytime would you be as thankful for it? As long as you leave the ketchup bottle far, far away, we’re cool. Ann Kim, a Korean transplant to the US, opened Pizzeria Lola in 2010 to celebrate her mother’s cooking (and her dog, Lola) through artisan pizza pies. Seven years later and Pizzeria Lola is not only a favorite for Twin City locals, but frequently finds its way onto “Best Pizza in America” lists. That’s thanks to her use of traditional Korean ingredients, like kimchi, in some drool-worthy Asian fusion pies. The Lady Zaza, for example, is a fan favorite: house made kimchi, Korean sausage, serrano peppers, scallions, sesame, and a soy chili glaze. It’s a pie so good, it could even solve the great takeout debate (Korean or pizza?). Papa’s is one of the best dang pizza places in the country, and also lays claim to being the oldest -- having opened in 1912 and never closed or changed hands. (This is hotly contested.) They are known for their “Trenton style” tomato pies, where the pizzas are made cheese first, then topped with sauce. But they’ve also got a special “mustard” pie -- where a spicy brown mustard is spread over the crust before it’s topped with the traditional cheese and sauce. If you ask the owner about it, he’ll tell you that a competing pizza joint (now closed) in the Trenton area used to do the same thing. He had an ex-employee from there join his team, and suggested they start making mustard pies themselves. For some reason, it stuck. The menu at Randy’s Wooster Street Pizza warns customers not to “knock it until you try” spreading peanut butter over your pizza. 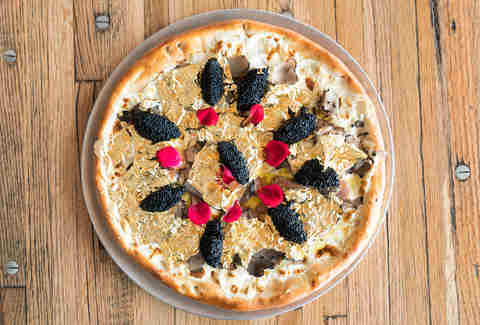 The combination, according to the pizzeria’s manager Carmen DiCaprio, is the brainchild of the owner. He was inspired to make a pie that honored his mother’s tradition of making peanut butter sandwiches with bacon. 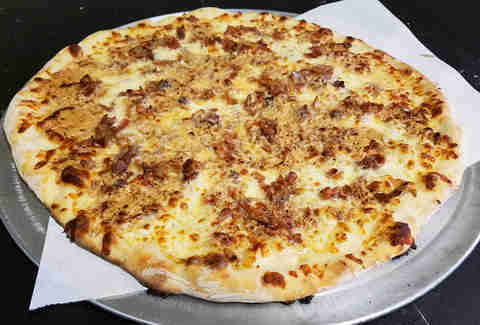 The pie is spread with Skippy’s creamy peanut butter (other brands, DiCaprio said, didn’t melt correctly onto the dough) then is topped with provolone instead of mozzarella, and then bacon. A strange combination? Sure, but it’s actually one of the top-selling pizzas at this Connecticut stop. You’ll never suffer groans about wanting mushrooms on your pie again. Corn may be a divisive choice for a pizza topping, but at Pizzeria Locale, its inclusion is as authentic as pizza recipes get. That’s because their chef, Jordan Wallace, brought the idea back from his travels in Naples, then created a pizza topped with fresh, local corn, crème fraîche, mozzarella, and ham. The result was tasty enough to inspire a second corn-centered pie on the Boulder menu, too: a special with in-season corn and black truffles. Brazil is one of the largest exporters of hearts of palm (literally the inner core of a palm tree) to the United States. 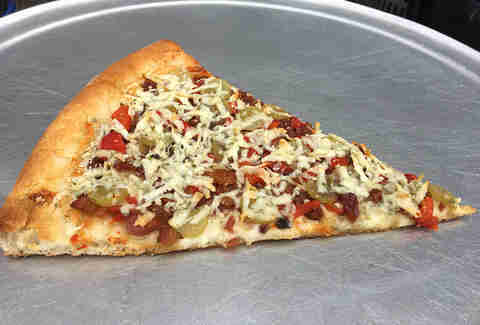 So it’s not really surprising that a Brazilian pizza shop in Newark would add the crunchy, artichoke-like veg to their pies. It’s as common a pizza topping in Brazil as peppers are here. In Brazil, they really mix up their pies with some crazy ingredients (hello, sweet peas and tuna fish) and that’s exactly what you’ll find at Brazilian Pizza. There, they use hearts of palm on several pizza varieties, whether you want it with hardboiled eggs and olives or Brazilian sausage. But if you want to let the ingredient shine, go for the Palmito pizza. It’s just hearts of palm and cheese on a regular pie. While buffalo chicken pizzas have become almost as ubiquitous as the margherita pie, Screaming Banshee Pizza has an offering that incorporates the entire buffalo wing experience into one pizza slice. That includes topping it with diced celery, the traditional accompaniment to buffalo wings you either treat like an inedible garnish or eat to use up the last bit of dressing. This pie is served with ranch, diced pieces of buffalo chicken, then garnished with the celery and scallions.